July Class and Component Prices were announced on July 30. The big news is butter prices. 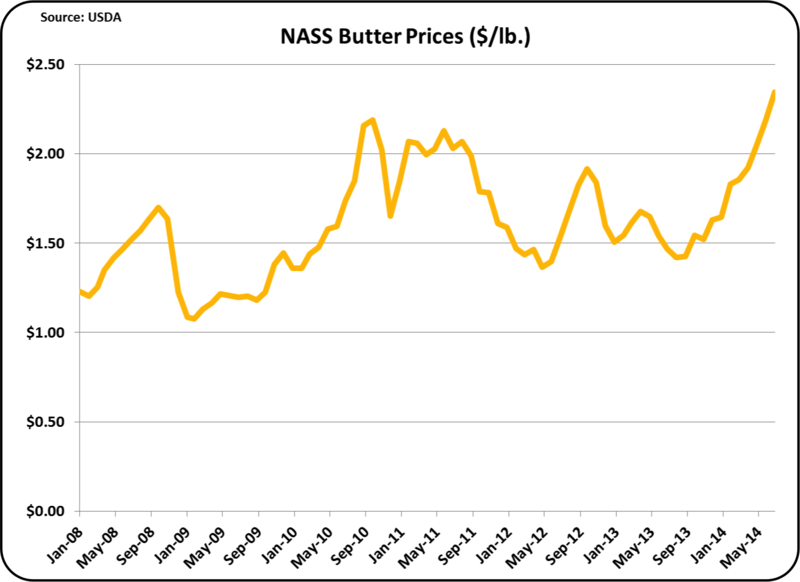 The price of butter as calculated by NASS hit a record high of $2.35/lb. This has driven every significant change in the pricing dashboard as seen below. 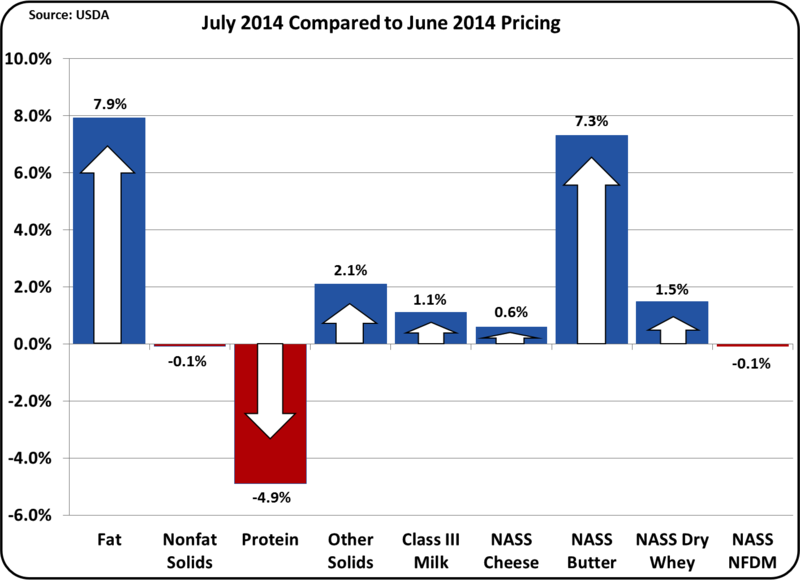 Milk protein was down only because butter prices were up. See the August 8, 2010 post to this blog for an explanation of this relationship. 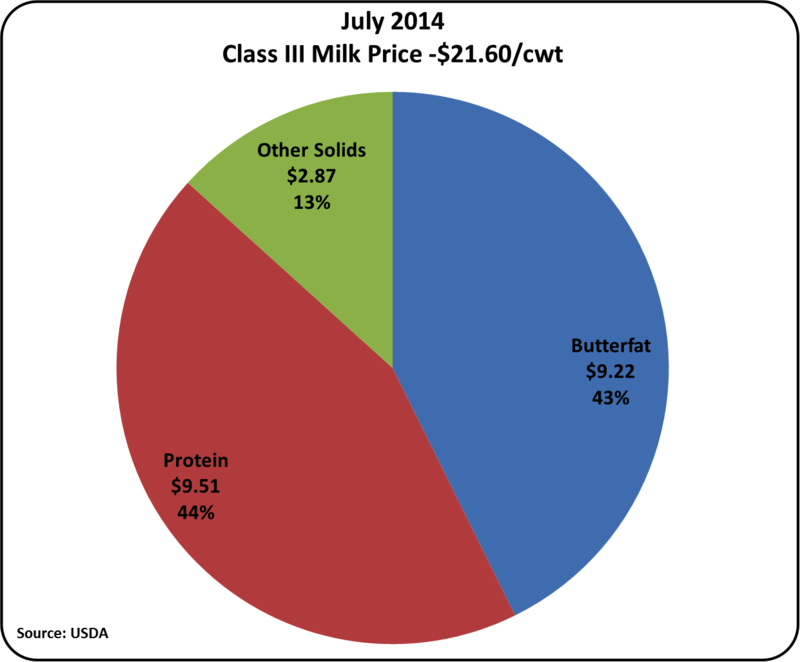 The July Class III milk price increased from June to $21.60/cwt. However, the Class III skim milk price dropped. The difference is the price of butter and butterfat. The long-term component price trends reflect the same picture. 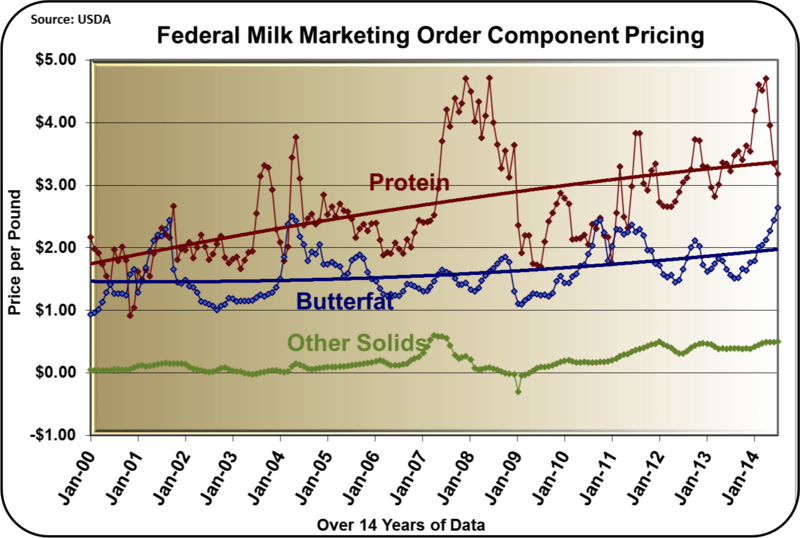 Butterfat is at record prices and this is resulting in lower milk protein prices. Other Solids remain at the $.50/lb. level. The table below shows the dairy product values that drive milk prices. The changes from June to July were all insignificant with the exception of butter. These are the dairy products that enter into the equations for calculation of skim milk and milk component prices paid to producers. The chart below shows the continuing escalation in butter prices. 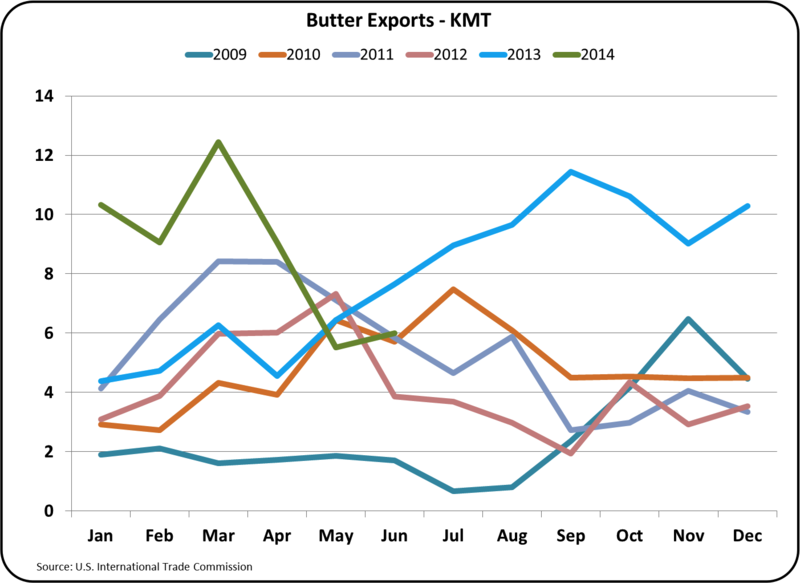 While butter exports have declined recently, inventories have not recovered and the tight inventories are causing the current price escalation. This will be examined in more detail below. The pie chart of producer revenue for those paid on the Federal Milk Marketing Order component system shows almost equal payment for butterfat and milk protein. Milk protein is priced at $3.28/lb. and butterfat is priced at $2.63/lb. By the USDA standardized component levels, milk protein is 3% of milk and butterfat is 3.5%. Combined, these numbers currently make payment for milk protein and butterfat essentially equal in value for the producer. The butter price levels are the result of very low inventories with no current trends indicating recovery. Current inventories are down nearly 50% from the prior year and are lower than any of the prior five years. There are only three things that can impact butter inventories. They are production, domestic consumption and exports. They are individually reviewed below. 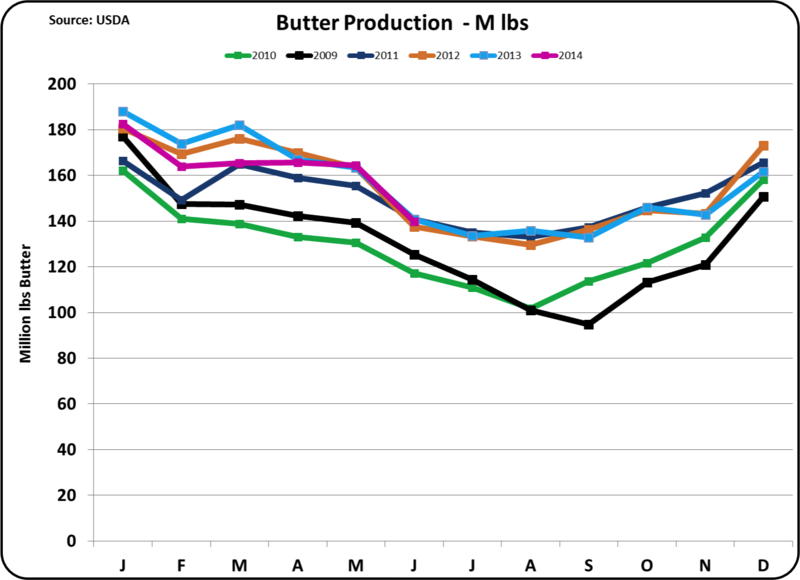 Production of butter is following the pattern of prior years. There is no significant change in butter churning during the last two years. The current low inventories are not the result of lower production. Cheese consumption, which represents the largest use of butterfat, has long-term growth trends. But, cheese prices are currently increasing, due to the high butterfat prices, and this typically reduces consumption. Cheese exports are up by 34% over the prior year and now represent 7.8% of cheese production. This is putting a little pressure on cheese inventories. Overall however, it does not appear that the butter inventory shortage is being caused by growth in cheese manufacturing. Increased domestic consumption of ice cream is normal at this time of the year, but it does not normally impact overall availability of butterfat. Increased ice cream consumption is not a likely culprit for low inventories. This may be some increased consumption of butterfat used in butter and butter blends that contain some butterfat. If this is true, it is a reversal of a trend for lower butter consumption than began in the 1940's. As data becomes available, it will be reviewed in the blog. Exports in the last half of 2013 and Q1 of 2014 were significantly higher than "normal", running between 10% and 12% of production. More recently, exports have decreased from the prior year. May was down 9% and June was down 22% from the prior year. While May and June exports represent a return to "normal" export levels, they have not allowed inventories to recover. 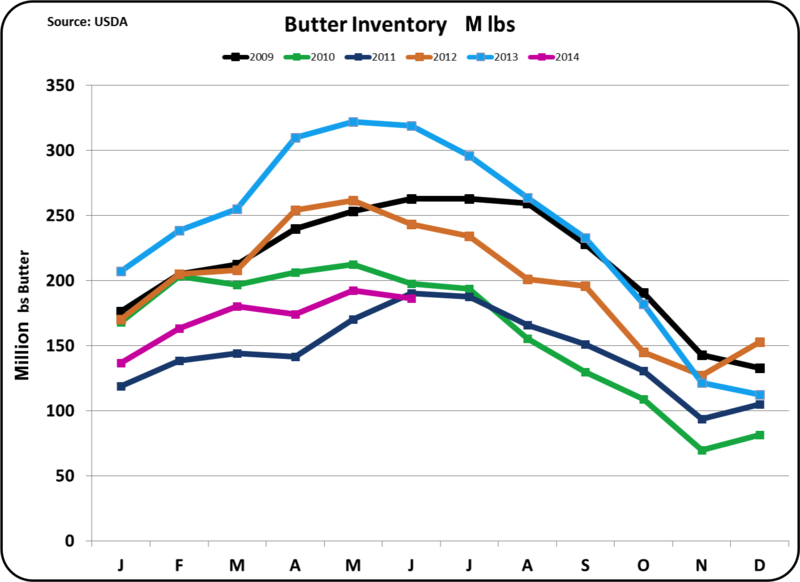 Most of the butter inventory decline can be attributed to exports in the last half of 2013 and Q1 of 2014. 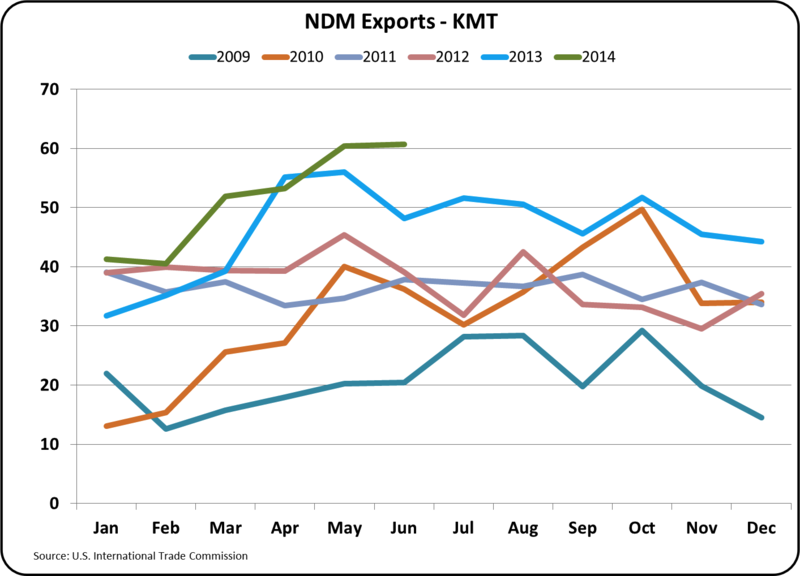 In the prior post to this blog, the impact of exports of NDM/SMP was discussed. In June a record 60,710 MT were exported. That represents a record 67% of NDM/SMP production. The price of NDM/SMP is clearly dictated by international prices. As mentioned in the prior post to this blog, global prices are declining and increased competition is expected especially from the EU. However, through July, there have been no price declines or loss of export volume. Class IV skim milk is priced based on the price of NDM, so the price of Class IV skim was also nearly constant between June and July. However, the gap between Class III and Class IV has widened. For an in-depth discussion of how this impacts all dairy prices, see the February 25, 2014 post to this blog. 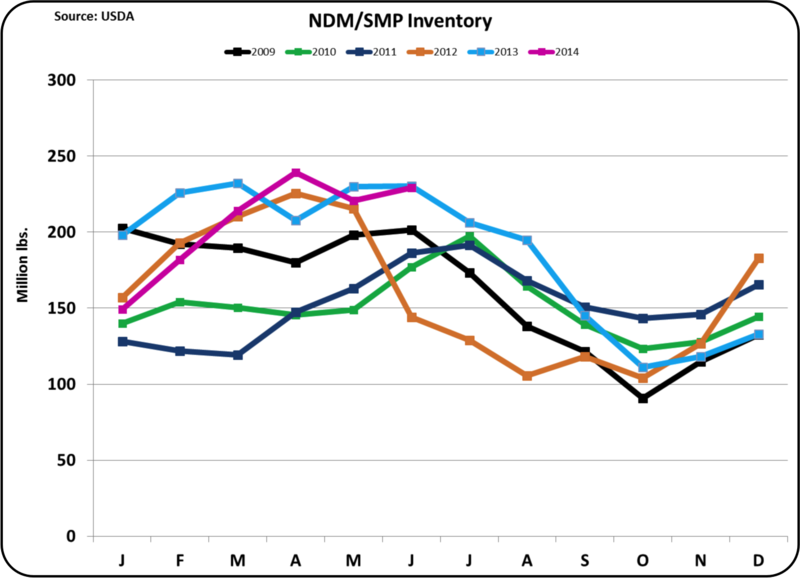 Inventories of NDM/SMP remain at reasonable levels, near historical levels. With the increased production of NDM/SMP, a slight inventory increase might be expected. There is, therefore, no immediate fear of a bubble caused by overproduction or insufficient demand. The prior post to this blog discussed how exports of NDM/SMP are changing the U.S. dairy industry and leading the way for the U.S. entry into supplying the global dairy markets needs. Through July, this leadership position has continued to expand. The price bubble for butter will decline in the coming months. This will reduce milk prices. However, the entry into the global dairy markets will undoubtedly continue to expand and change the nature of the U.S. dairy industry. Components will become more important than ever as an increasing percentage of the milk will be exported or processed into products like cheese and yogurt. Production of components will likely receive increased emphasis.